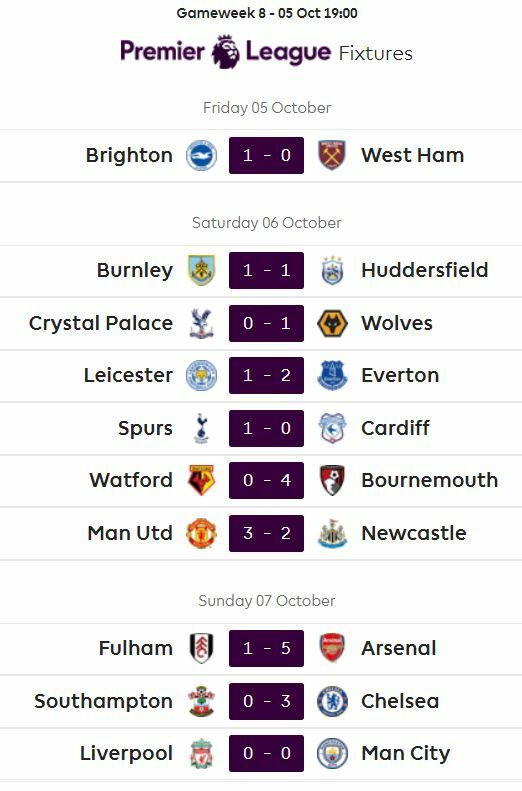 They are just for GW8 not cumulative. It only includes players who started no subs. The article is in 2 parts. We’ve started with the attacking stats for the players divided by position. 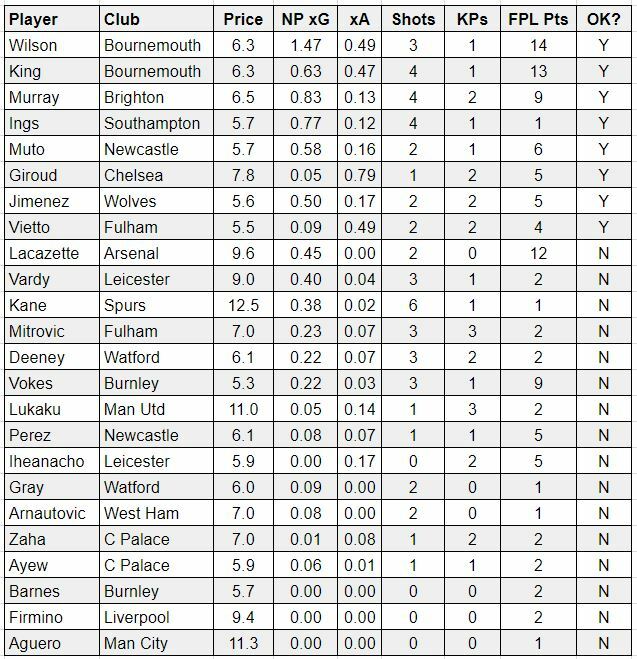 Effectively we’ve taken their Non Penalty xG stats and their xA stats and converted them into FPL points and then ranked them. We don’t show the points but that’s how they’re ranked. It’s far more useful than just ranking them by NP xG and xA separately. I’ve tried to include who I think has the best stats plus added on some notable players that people will be interested to see how they performed. I haven’t attempted to rank every player. There’s shots and key passes so you get a volume perspective as well as a quality perspective. 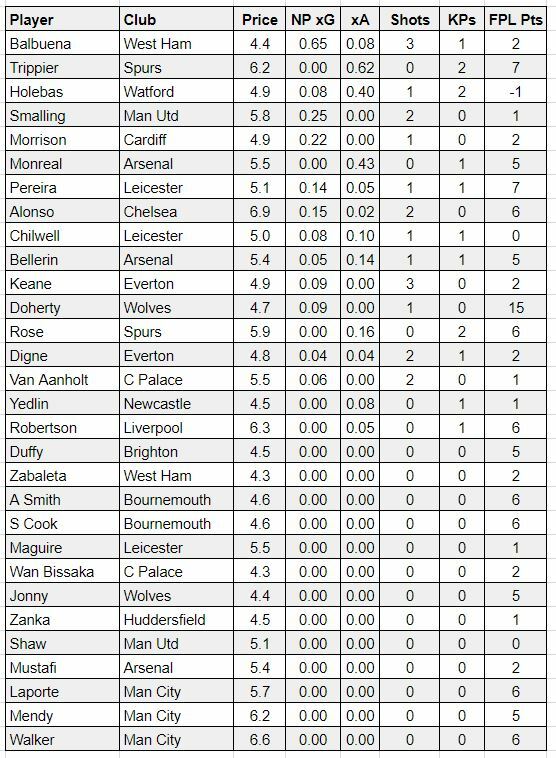 I’ve also added a column where I have said yes or no to midfielders and forwards as to where I think their stats were adequate for their price. I’ve used an average ratio as a benchmark but it’s possible I still need to do more to see what the ratio should be. Martial was wide left and very advanced. Pogba’s average position was very deep. Solly March played as a number 10 for Brighton although temporarily, I imagine, until Gross is fit. Knockaert was very advanced and drifted in centrally. 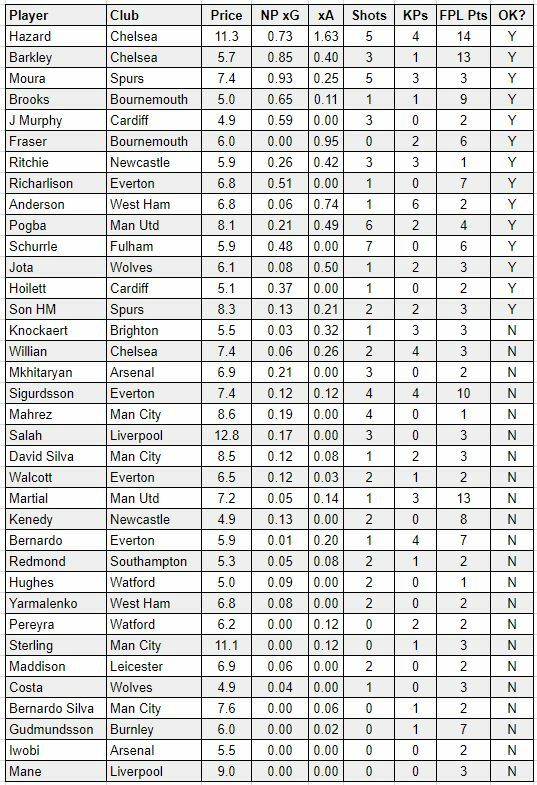 Zaha although the LW in a front 3 had a fairly central average position. Costa was more advanced on the right than Jota on the left. Liverpool were in their front 3 although Salah way ahead of everyone, Firmino dropped deep as did Mane. Sorry for my ignorance but what is KP? Cheers for that. Love your site BTW! Has really helped a FPL newb like myself to get into FPL with a good start. Keep up the good work.